July 4, 2017: Mercedes-Benz India will launch the 2017 GLA facelift tomorrow. The update will be mostly cosmetic with minor touch-ups here and there. It'll get a new grille and a new set of alloy wheels. On the feature front, the GLA facelift will get rid of the HID headlamps in favour of LED lights. The SUV may also get a minor bump in the ground clearance as well to earn the SUV badge. The GLA facelift will retain its 2.1-litre diesel engine and the 2.0-litre petrol unit along with the shared 7-speed dual clutch transmission. The prices may get a bump, but GST effect should negate that hike. So, expect the pricing to be more-or-less the same as before. Mercedes-Benz GLA Class prices start at Rs. 34.38 lakh for petrol and goes upto Rs. 34.38 lakh. The prices of GLA Class diesel variants start at Rs. 32.33 lakh and the top-end diesel is priced at Rs. 38.64 lakh. Mercedes-Benz GLA Class is available in 4 variants and 5 colours. The claimed ARAI mileage for the Mercedes-Benz GLA Class petrol is 13 kmpl, and for the Mercedes-Benz GLA Class diesel is 17 kmpl. Q. Which is worth to buy between Audi Q3, Mercedes GLA and CLA 200 and Toyota Camry with in a budget of 40-45 lakhs? 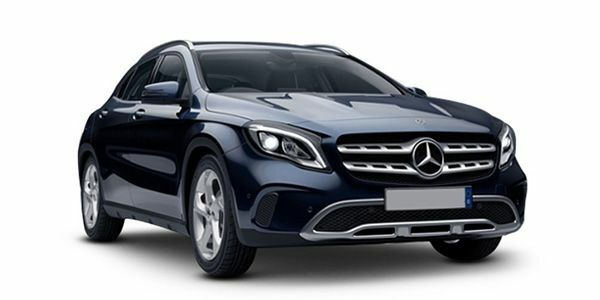 Mercedes Benz GLA-Class is a compact SUV available in the Indian market at Rs 31.72- 38.03 lakh (ex-showroom, Delhi). The GLA comes with two powertrain options- a 134 BHP/300Nm 2.2-litre Diesel engine and 181BHP/300Nm 2.0-litre petrol engine, both mated to 7-speed automatic DSG transmission. The key highlights of the GLA’s design include aggressive grill upfront, black-tinted xenon headlamps with LED DRLs, and 1494 mm tall stance which makes it look more like a crossover than SUV. The prominent features inside the cabin include leather upholstery, chrome accent, multifunctional steering wheel, 60:40 rear seat split, Eco Start/Stop system, Power windows with one touch control, automatic climate control, PARKTRONIC reverse parking system with camera and sensors, ergonomically designed front and rear seats, electrically adjustable outside rear view Mirrors, and driver seat with memory function. In the Indian market, Mercedes GLA-Class is rivalling the propositions like BMW X1 and Audi Q3 among others. Fancy yourself a GLA? Find out which variant makes the most sense for you.